Part 1 Biomimetic principles, production and properties: Recombinant DNA methods applied to the production of protein-based fibers as biomaterials; Purification of protein solutions; Spinning of fibers from protein solutions; Biomimetic principles of spider silk for high-performance fibers; A biomimetic approach to the production of sustainable structural composites using plant fibers. Part 2 Biomimetic applications in textiles: Biomimetic principles in clothing technology; Self-cleaning textiles using the lotus effect; Analysing the thermal properties of animal furs for the production of artificial furs; The role of plant stems in providing biomimetic solutions for innovative textiles in composites; Bionic developments based on textile materials for technical applications. Biomimetic materials are those inspired from nature and implemented into new fibre and fabric technologies. Biologically inspired textiles explores the current state of the art in this research arena and examines how biomimetics are increasingly applied to new textile technologies. Part one discusses the principles, production and properties of biomimetics. Chapters include recombinant DNA technologies and their application for protein production, spinning of fibres from protein solutions and structure/function relationships in spider silk. The second part of the book provides a review of the application of biomimetics to a range of textile applications, including the design of clothing and self cleaning textiles. 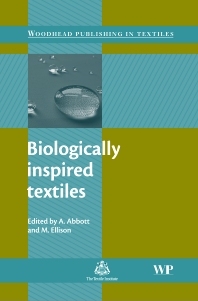 Written by a distinguished team of international authors, Biologically inspired textiles is a valuable reference for textile technologists, fibre scientists, textile manufacturers and others in academia. Albert Abbott is renowned molecular geneticist and a Professor in the Department of Genetics and Biochemistry at Clemson University. Michael Ellison is a Professor in the School of Materials Science and Engineering at Clemson University, USA. He has established a large international research program in biomimetic advanced materials.